Teacher may want to preview all the videos prior to teaching with your kids so you know what to expect. Try looking ahead on Saturday or Sunday of the week you do each lesson! 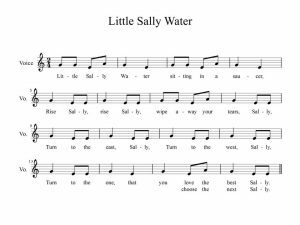 Part 1:Watch This video with your children to learn Rain, Rain and Little Sally Water. Echo back with my girls when I pause. Words are in your orange book, 150 Folksongs. Feel free to watch more than once if you need to to learn the song well. 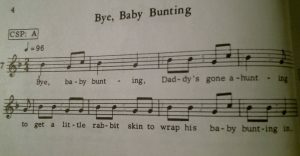 Part 2: Watch This video with your children to learn Bye Baby Bunting and A Tisket A Tasket.. Echo back with my girls when I pause. 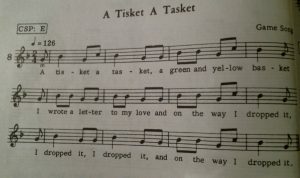 Words are in your orange book, 150 Folksongs. Feel free to watch more than once if you need to to learn the song well. Please watch these videos as an intro to the Exercises we’ll be doing in the next term.